Ada pertanyaan untuk Ridgeview Chalets? Terletak strategis di area berbelanja di Cagayan De Oro, Ridgeview Chalets menyediakan tempat yang kondusif untuk melepas penat dari kesibukan Anda. Dari sini, para tamu dapat menikmati akses mudah ke semua hal yang dimiliki oleh kota yang aktif ini. Properti ini terletak di sekitar obyek wisata populer di kota ini, contohnya SM Kota Cagayan de Oro, SM Mall, Bridge Education & Training Academy. Di Ridgeview Chalets, pelayanan istimewa dan fasilitasnya yang unggul akan membuat pengalaman menginap Anda tidak terlupakan. Untuk kenyamanan para tamu, properti ini menawarkan WiFi gratis di semua kamar, resepsionis 24 jam, fasilitas untuk tamu dengan kebutuhan khusus, Wi-fi di tempat umum, tempat parkir mobil. Para tamu dapat memilih dari 22 kamar yang semuanya dilengkapi dengan suasana yang tenang dan harmonis. Fasilitas hiburan properti ini seperti pusat kebugaran, lapangan golf (sekitar 3 km), kolam renang luar ruangan, pijat, kolam renang anak dirancang untuk bersantai. 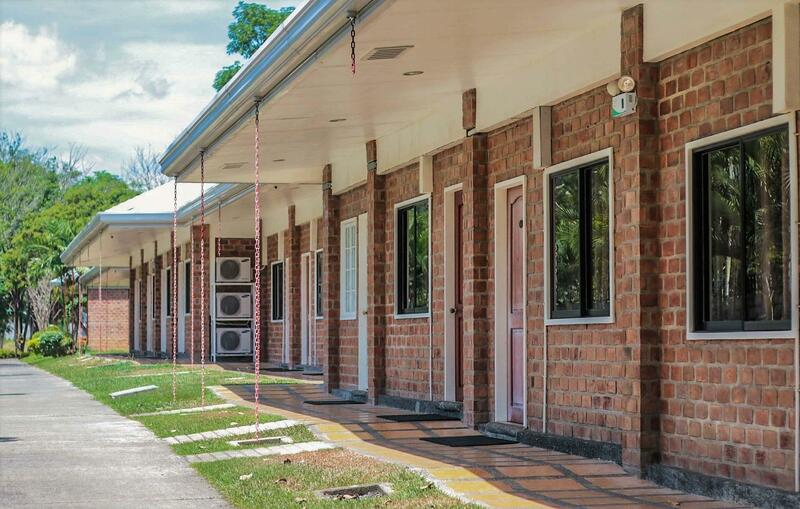 Ridgeview Chalets adalah pilihan yang cerdas bagi para wisatawan yang berada di Cagayan De Oro dan menawarkan pengalaman menginap yang menenangkan setiap saat. -Pulang-pergi: PHP 600 per tamu per antar-jemput. -Sekali jalan: PHP 500 per tamu per antar atau jemput. The Ridgeview Chalets had a bedbug infestation the likes with which I’ve never seen before. Luckily all the tossing and turning due to what I thought were very clandestine mosquitos caused us to inadvertently kill about 4-5. The carcasses were readily visible on the bed once the covers were pulled back—one sole survivor was crawling across rust-stained sheets. They were in my girlfriend’s scalp it seemed due to the incessant scratching she did while sleeping. The front desk didn’t apologize, or offer any kind of concession. Welcome to the worst part of the Philippines. No complimentary toothpaste;the small packets cost 10php each at the front desk. The shower was falling apart and water pressure is limited. If you like hot showers, you won’t find it here. The security is good, but the hotel is located on a bluff where evening traffic will cause you to sit in a cab for 90 minutes going from SM Downtown with only one main access road up the bluff. We loved how relaxing it was! Visited during off season, unfortunately during the time they were maintaning the pool. Staff very friendly and professional. Breakfast was good. Located in an upscale subdivision so its nice and peaceful to walk around at night. Its just far from airport and city activities, which is not an issue for us. The lock on windows are broken, although the staff tried to repair the 2nd day i was there, they couldn't so they installed a stick to block the opening of the window for me. Dresser has two locks, but only one has the key, so they physically changed the lock for me so I can lock up one, and in room safe is upon request (I want to keep my passport safe), and just laying inside the dresser, not bolted down, so I ended up carrying my passport everywhere anyhow. I booked a sing big bed, but they only had a room with two single beds. The single beds are VERY SMALL and I can easily roll off it at night, and over all, it's probably fun for a family to go there and stay and play, but those 2 days I was there, they had to setup for a big events that's coming up so lots of blocking off of the area, loud PA system testing, and band practicing music (very loud) starting 9am till some part of the afternoon. First time staying here, probably will stay again if I have a chance to be on vacation and not have to worry about my valuables and passport. Coming back since 8 years should mean something, only real disadvantage is location and getting to town. I would rate the stay A+ with the only complaint being unreliable wifi which should not be as big an issue as it is a constant irritation for an international traveler. Clean accommodations, fast room service great pools and family friendly. The hotel rooms were nice with balconies or a patio area outside the doors of the condo type units.Room service was great but the attentiveness of the staff in the dining room left something to be desired. Great family resort with 2 separate swimming pools, one geared especially for younger kids. Other activities included a bowling alley and other games available all for a nominal fee. Close to shopping, night life and the downtown area. We were there for the scuba diving and white water rafting, both of which did not disapoint us. There is a new airport which is not advertised, about 1/2 hour away costing about 500-600 PHP, no public transport either way except taxi and the resort shuttle which was slightly cheaper, old airport which was 10 minutes away closed last fall. Apparently not the easiest place to find because the taxi drivers were never sure of where it was. Check in and out was kind of a slow process but all in all a pleasant experience. I would return there on my next trip. every year there is an excuse, but it doesn't change the fact that on most days, the wifi in the rooms does not work. Enjoyed the stay. Mostly the pools and the food from the restaurants. The restaurant had a very good selection which most hotels now days are just terrible. I will return.